Left- right: Niki Munk, Ann Blair Kennedy, and James Specker. Everyone has those people, places, or things they revere and “geek out” over. Mine tend to be science and research related (Research Geek Indicator: I have a signed copy of Creswell’s Research Design as a prized possession). 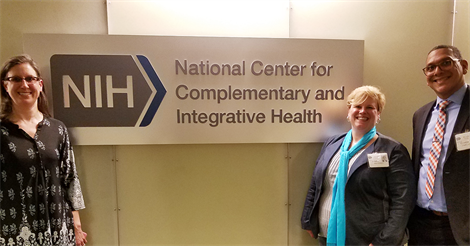 I was recently invited to accompany American Massage Therapy Association (AMTA) representatives James Specker and fellow researcher and former Foundation Trustee, Ann Blair Kennedy to meet with leaders at NIH’s National Center for Complementary and Integrative Health (NCCIH, formerly NCCAM). With this trip, I had the opportunity to visit a place I deeply respect and meet with Acting Director, David Shurtleff and Acting Deputy Director, Wendy Weber among others. The meeting was arranged by AMTA to speak about the importance of massage therapy research related to the current and future funding landscape and NCCIH priorities. AMTA was particularly interested in how they and the massage field, in general, could better position themselves to move massage research forward and bring massage’s potential benefit to broader communities in need, such as those related to the opioid crisis. The National Institutes of Health consists of 27 Institutes and Centers each with their own missions regarding an area of focus to support the NIH’s overarching mission, “to seek fundamental knowledge about the nature and behavior of living systems and the application of that knowledge to enhance health, lengthen life, and reduce illness and disability.”1 NCCIH exists in large part to help build the evidence about the value of massage therapy and other complementary and integrative approaches in order to help guide federal policy to ensure access to care for the programs under its purview. Many of the most sizable massage research studies of note receive(d) funding through NCCIH/NCCAM. However, while NCCIH has funded many of the massage-related NIH research, massage focused research makes up a relatively small proportion of the agency’s total research portfolio. NCCIH representative meeting attendees stressed this is not a reflection on NCCIH’s interest in massage research but more on the number of related proposals received per cycle, which are relatively few in the grand scheme of things, and budgetary constraints (NCCIH was allocated $130.5 million in 2017 compared to larger institutes whose budgets can span into the billions). I posit that the relatively low number of massage-related NIH funded research is potentially due to the low potential for numerous, high quality research proposal submissions, which I suspect relates directly with those who are interested in and able to conduct massage related research. Not surprisingly, nearly all of the NIH funded massage therapy research has been conducted by non-massage practitioners; most NIH funded massage research principle investigators or PI (research study and team leader) are not massage practitioners, rather they are research trained individuals with an MD or PhD with focus in a related home discipline. When I refer to low potential for high-quality proposals, I’m not suggesting that the proposals submitted by these folks are of low quality. On the contrary, those who have been successful in acquiring coveted NIH research funding are likely well trained specifically in research design and importantly, scientific and grant writing. These non-massage therapist researchers have incorporated their massage intervention interest(s) into a larger, more research sustainable field (e.g., medicine, public health, psychology, behavioral health, etc. ); increasing the potential for high-quality research proposal development and submissions from these fields, because these are the people trained in such respects. It should be noted here that these home disciplines of non-massage practitioner researchers do not necessarily value massage therapy. This “devaluing” of massage can discourage researchers’ willingness, interest, and ability to delve into massage research (through discouragement) and could jeopardize a researcher’s success within their home institution/employer if their work does not directly contribute to their home discipline. 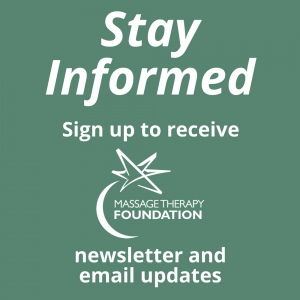 This is concerning because it means that those who are primarily conducting massage related, funded research may not be inclined and/or able to continue with their research program development based on non-massage interested environmental factors. 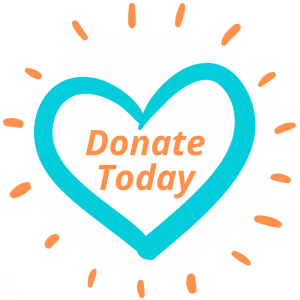 The massage field should want and support those who are funded for and conducting massage research to be “housed” in an environment supportive of such endeavors. I fear that so long as the massage therapy field primarily exists outside the research arena, the non-massage practitioner researcher will remain those who predominately conduct the majority of funded massage research, which limits the extent to which the massage field is actually engaged in and leading the research. I believe that those who should be the most interested and involved in massage therapy related research design and completion are those people actually in the massage therapy field. Unfortunately, the massage field as a whole is not well poised for this to be reality. Few massage therapists interested in conducting research have such training or if they do, lack positions supportive to the incredible time requirements to develop, propose, and conduct high, NIH funded level research. This, in my view, is likely a key contributor to what I expect is an overall low number of high quality massage therapy related research proposals to NCCIH (at no point during the NCCIH meeting were specific number of massage related proposals specified or the quality of received proposals). In relation to the “long game” of massage therapy research, I think the massage therapy field needs to do more to support and prepare massage therapy practitioners for careers in research. I will use as a case-in-point a keen area of funding interest NCCIH discussed during the meeting: neurological and brain responses to massage therapy from inflammation, blood, and tissue perspectives. NCCIH is interested in the mechanistic underpinnings of massage therapy, particularly neurological activation for and responses to massage therapy. I imagine few massage therapy practitioners (research interested or no) have the skills and access to neurological testing and imaging measures for such research design, proposal writing, or conduct. I imagine too that such statements or funding interests could squelch potential enthusiasm for or interest in research training for massage practitioners (few massage therapists that I know are interested in the schooling required for neurological specialization). Research addressing this or similar funding priorities will require non-massage practitioner research leaders and/or collaborative research endeavors; both potentially challenging tasks. I encourage the massage field to consider this challenge in three other, more positive and forward thinking ways. 1) NCCIH values massage therapy so highly that establishing its mechanistic principles (neurological and otherwise) is a funding priority. 2) Through policy and funding opportunities, NCCIH encourages the collaboration of research professionals and/or institutions with massage training, practice, and/or professional institutions/individuals to leverage necessary skills from multiple sources. 3) NCCIH values and has potential support mechanisms in place for new and emerging researchers with practitioner training and experience. These three items hopefully signal a bright future for massage research development and practice collaborative opportunities. I have always been and will forever remain a proponent of stronger links between massage therapy practice and research; an important means through which is the cultivation of massage practitioner researchers trained, skilled, and placed/working in research environments at all levels. Dr. Kennedy, a very small group of other massage practitioner researchers, and I have completed the extensive training needed to design, conduct, and lead research at the level of NIH funding and work in institutions with the needed research infrastructure to qualify for and support awarded research. There is much work to be done and I believe more massage field affiliated professionals are needed in academic and research positions to meet the need and cultivate a strong research culture in our profession. Organizations such as AMTA and the Massage Therapy Foundation could be instrumental in further developing a strong research culture in our field with their continued interest in, advocacy, and funding for massage related research in addition to increasing focus on research training and career pathway development for practitioners. I know my roles with both the Massage Therapy Foundation and AMTA focus on these aspects. My visit to NCCIH with AMTA leaders working to focus on the long game of research was an honor and a privilege. To say the least, my geek-o-meter was firing on all cylinders during the short visit (and yes, I did get a t-shirt). More importantly, I had the opportunity to represent early career practitioner researchers in our field to the primary funders of meaningful and important health related massage research. I hope that soon, I will pen another blog in which this Massage Therapy Foundation Trustee will report the successful acquisition of NCCIH funding focused on massage therapy. In the meantime, I look forward to furthering my contribution to massage related research through my roles as a Massage Therapy Foundation Trustee and researcher housed within Indiana University’s Department of Health Sciences.